Carry all your tools, laptop and business materials in one rugged wheeled case. Handle extends to 37". Exterior is made of durable nylon and is reinforced with a rigid frame. Curb/stair skids provide added durability. Tool section holds two 17-3/4 x 12-3/4" tool pallets. Three removable zippered pouches are perfect for storing a multimeter, probes, etc. Padded Laptop section holds computer up to 10 x 13", removable pouch stores laptop accessories and pockets hold CD's and diskettes. Briefcase section is equipped with multiple pockets for phone, business cards, pens/pencils, documents and more. Outside zippered pocket allows for quick access to airline tickets and documents. Balldriver set, inch (8): .050-5/32"
Nutdriver blade set, inch (9): 3/16-1/2"
Pliers (6): Chain nose w/cutter 6-1/2"; mini chain nose 4-3/4"; diag. cutters 5"; mini diag. cutters 4"; groove joint 7"; locking long nose 6"
Screwdrivers (8); Phillips #0 x 3", #1 x 6", #2 x 4"; slotted 3/32 x 3", 1/8 x 6", 3/16 x 3", 3/16 x 8", 1/4 x 4"
Socket set, 1/4" drive, (13): 3/16-1/2"
Click the button below to add the Jensen Tools JTK-32M Elec. Equip. 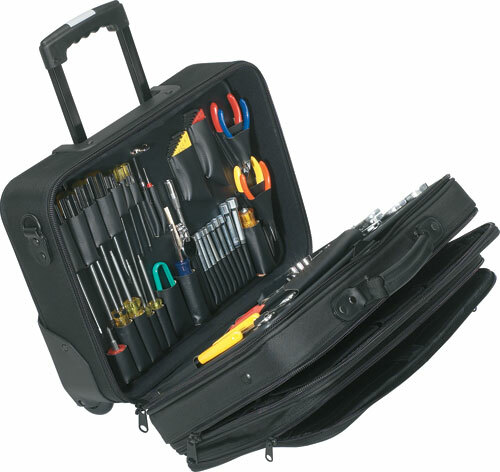 Install & Service Kit in Soft-Sided Tote Case to your wish list.